My gorgeous wee boy Dan, aka ‘Chipolata’ (long story folks) is coming up to the five month mark. The time since his birth seems to transcend the normal laws of physics. In some ways it has whizzed by, and in other ways I am still waiting for that magical moment ‘when things get easier’ (I suspect I may see unicorns cavorting in Brigadoon with the Loch Ness Monster when this happens…). We had a dreadful start with his sister, so we were delighted to have text book baby second time around. The first couple of weeks were wonderful. Chipolata slept well, fed without any problems, and was very responsive and alert. And then, the wheels fell off. At the three week mark he started to get unsettled. Some feeds were a battle as he would go on and off the breast repeatedly. There was lots of crying. Not just normal baby crying – like all day crying, whinging and fussing. It was horrendous. Our poor daughter barely got a look in as all my time was taken up by her miserable brother. For the first few weeks Chip had been an amazing sleeper, only waking up once in the night. Now, he began waking several times. Something was definitely wrong. We had discussed reflux at our antenatal classes so I knew what to look for, and how awful it was for the baby and their parents. Chip wasn’t spilling at all and some feeds were fine, but he was showing most of the other classic signs. I prayed ‘Please God, don’t give me a reflux baby’. We happened to take Chip to the hospital to see a paediatrician about something unrelated, so the Doctor assessed him for reflux too. The paediatrician wasn’t sure if it was reflux, and neither were we, so we agreed to wait and see. We didn’t want to medicate Chip if it wasn’t necessary and the Doctor was more than happy to see us again if needed. I went home relieved, knowing that if Chip needed medication, we could get it. I’ve heard horror stories about parents battling with doctors to get it, as some doctors are loathe to medicate babies and expect parents just to ‘ride it out’. The unsettledness continued so we went back to see the Paediatrician. I fed Chip in front of him, and he said almost immediately ‘I’m convinced your son has reflux. See how he’s arching his back?’ And so we began medicating our son. Chip is on Omeprazole, and while it has helped a great deal, it is not a miracle cure. Reflux is still very much the unwanted member of our family. Get your baby to a health professional. Untreated reflux can cause serious damage to your baby’s oesophagus. Your baby may not require medication, but your paediatrician may recommend a course of action to help manage the reflux e.g. going dairy free (Sadly, I had to wean Chip off breastmilk and on to soy formula as his reflux is most likely caused by an allergy). While you are there, ask what practical home help may be available (often none, unfortunately). Get informed. I would recommend any expecting parent to read up about reflux, and its similarly unwanted cousin, colic. 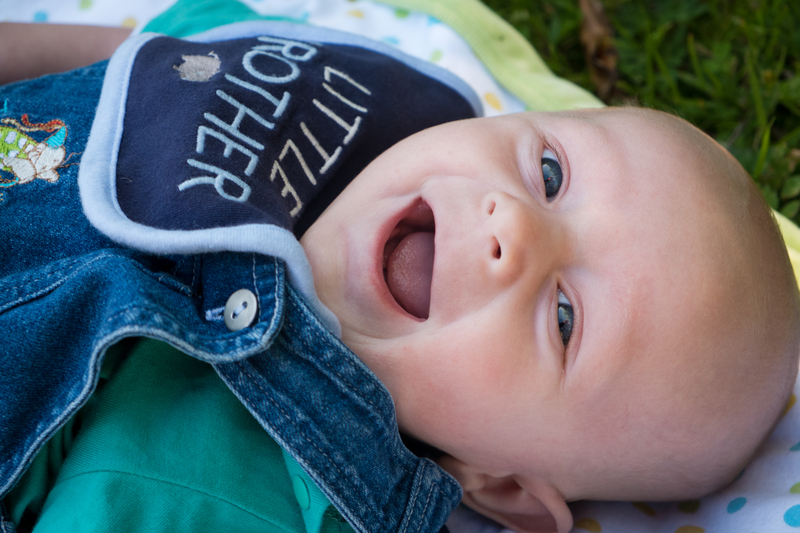 You need to know what the signs are so that if your baby starts showing signs of reflux (there’s not much that can be done for colic, sorry) you can get help immediately. The website Crying Over Spilt Milk is an excellent resource for parents, with detailed descriptions of symptoms and likely treatments. Call in the village. Let me say that again. CALL IN THE VILLAGE. Especially if you are a single parent. Until you get a diagnosis and a course of action prescribed, you will be stuck with a screaming baby. All day and night. Some people may be able to cope with this, but most of us can’t. That crying is biologically wired to upset you to your core, so please dear parent, ask for help from your support network. Reflux is not only a problem for the baby, it becomes a problem for the entire family, if you have other children to care for. Not being able to cope and take care of both my children simply compounded the stress for me, and some days I don’t know who cried more – me or Chip. I was barely able to keep it together for a while there. My mother and my mother-in-law were indispensable, pitching in to help however they could and looked after my daughter. We also were very blessed to have a church friend who used to be a Karitane Nurse so she was well-versed in helping families in our situation. She spent several weeks coming to us in the mornings until Chip’s medication had started to work, and we felt able to cope on our own. If you don’t have family living near you, call them and plead for help. Ask any trusted friend, colleague, neighbour, for help if you feel unable to cope. Yes, it’s hard to say ‘I’m not coping’. But most people love to help in any way they can if you have the courage to be vulnerable with them. If you are in a relationship, be kind to each other. Having a reflux baby is extremely stressful, and it’s hard to be nice to your partner when you are both strung-out and tired, and don’t know what to do next with your screaming baby. Share the load as much as possible. If one of you is struggling, see the previous point about calling in that village. Forget the housework, farm out your laundry, and sleep whenever you possibly can. Talk to other parents who’ve been on the reflux journey. Reflux is very common but I have still been surprised at just how many parents I have spoken to about Chip’s reflux have said to me ‘Oh, all/some/one of my kids had reflux.’ These people not only feel your pain, they can be a mine of information on how to ease the symptoms, or simply cope. Try all the non-medication tips you can. Simple things like elevating the head of your baby’s bassinet, wearing them in a front pack, and dietary changes for breastfeeding mothers can make a big difference to some babies. Accept that the journey may be difficult and long. Most babies grow out of reflux by the time they are 10 months old. It usually gets better as the baby learns to sit up and is therefore upright most of the time. But some tots continue to suffer well into toddlerhood and beyond. While I still vehemently wish Chip didn’t have reflux, I have (almost) stopped wearing myself out trying to ‘fix’ it. That was exhausting. Instead, I have resigned myself to the fact that he has reflux for the time being and am trying to be at peace with that, as much as that’s humanly possible. Oh heck, you poor thing! And poor Bub! How did you cope? I hope your son is better now. It was a challenge! Everytime i fed him he would projectile vomit, not good for infants! By the time he was 14 weeks. He stopped, doctors said he “grew out of it” but would need surgery later in life. Almost all cases of Pyloric Stenosis you get the surgery while youre an infant. I hope he doesnt have major issues when hes older!! Gosh, I really hope he doesn’t need it, poor thing. Pyloric Stenosis sounds horrendous – I can’t imagine having to endure that for 14 weeks as a mama! Blessings to you both. He is completely fine now, just hoping it stays that way! 🙂 He’s an eating machine. haha.